Hi I'm Emily. I'm 34 years old and I am a primary school teacher. 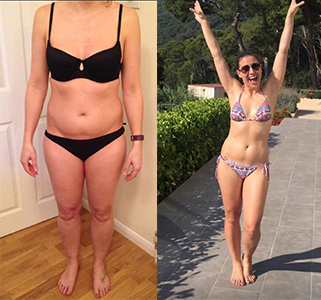 I’m an all or nothing girl – exercising and eating well (or dieting) or doing nothing and eating rubbish. My weight was creeping up and I needed to find a balance where I could allow a treat or two without completely falling off the wagon. When I signed up for the 8 week Kickstart Programme, I wasn’t sure what to expect. As a PE teacher for 10 years I thought I knew how to eat and be healthy. I was wrong. I have spent so many years yo yo dieting that I have got into bad habits and got stuck with poor food management. A great example is carbs. I found that at the beginning of the programme I was cutting out carbs but then I was hungry. Lorna has taught me how to replace the carbs I was eating for better carbs for my body. Even with the exercise, although I know how to keep fit, I found that my old understanding and habit of all or nothing was affecting exercise. I didn’t know how much to do and didn’t have a routine of mixing up my workouts to keep them interesting. I also found that setting goals at the beginning really motivating. I met some half way through which was amazing and inspired me to set new goals which again many I smashed by the end. The daily articles are brilliant. I’ve learnt so much about how to manage different aspect of my health. One of my favourite articles was about cheerleaders and saboteurs and this has made me more able to handle situations where there is temptation. The programme hasn’t been easy and I have had slip ups. I was in France for a week on holiday and away with work for a week but Lorna helped me through both, allowing me to enjoy myself in a controlled way without falling completely off the wagon. Lorna has been amazing and I really didn’t expect this program to work so well. After 8 weeks, I feel like this is just the start, I have set new goals know that this will have changed the way I eat forever. · Eat but just make sure you eat healthy – this is not a diet, it is a way of life. · Plan – get organised and it makes it much easier to stay on track. When you are not organised it is so easy to fall off. Were you inspired by Emily's story? If so why not start your own journey?